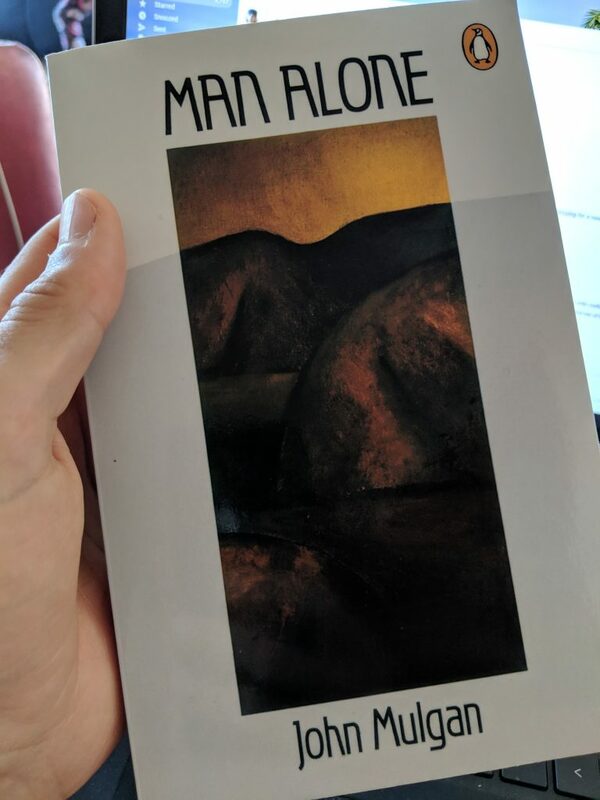 In mid 2018 I started working on a plan to ‘recreate’ a classic piece of NZ literature by John Mulgan entitled “Man Alone”. Set in 1920 the story follows the journey of protagonist ‘Johnson’ who flees the scene of an accidental homicide fearing potential murder or manslaughter charges. To evade pursuants he flees, first on horseback, then on foot across the North Islands central volcanic plateau. 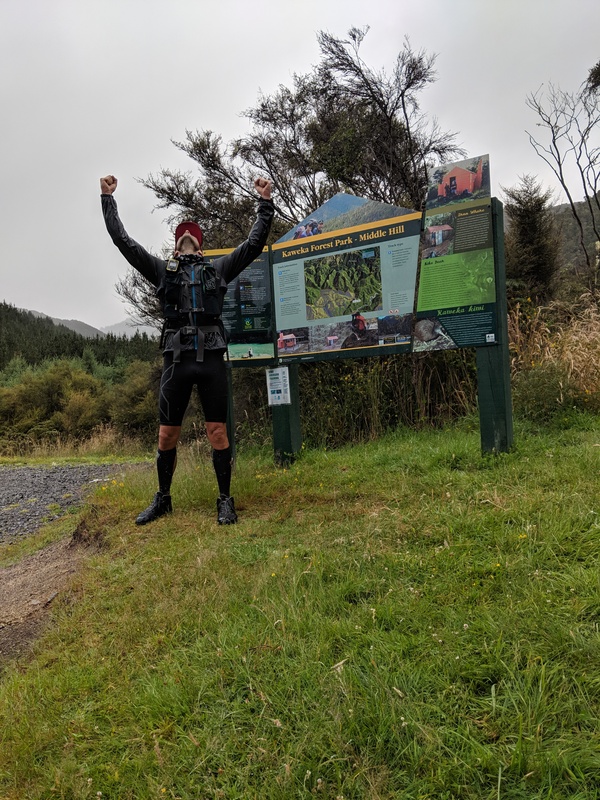 For 3 months he endures hardship and the hands of the terrain and elements working his way gradually eastward first from Tongariro National Park, into the Kaimanawas and eventually out to the Hawkes Bay via the Kaweka mountains. Through reading (and rereading) the novel I was able to ‘best-guess’ the route taken by Johnson in his epic 3 month ordeal. A route was drafted and a plan was formed. 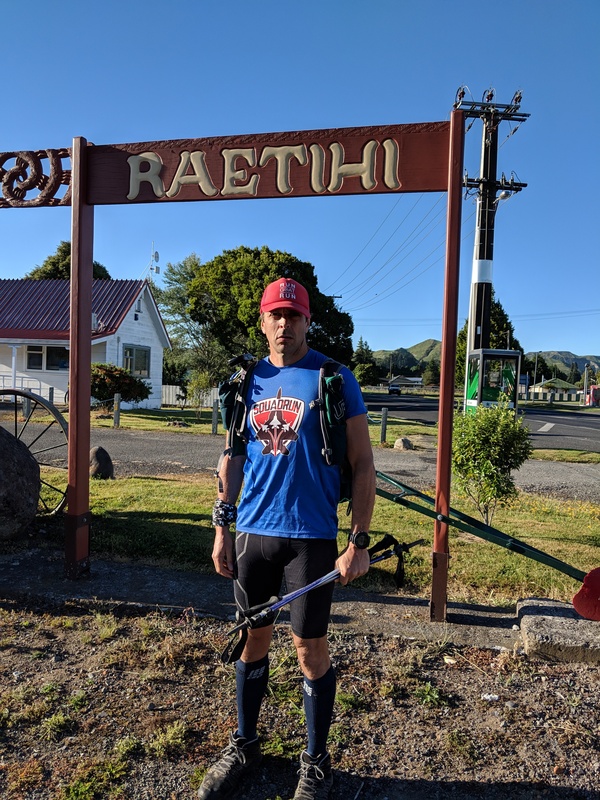 In mid January of 2019 a brief opportunity to wedge this trip into my calendar presented itself and with minimal prep I hurriedly packed and departed for my starting point in Raetihi. The goal was retrace Johnsons route using what access and trails as are available in the area. To my knowledge, no such attempt has previously been made. My “Man Alone” journey began in the early morning of Saturday 12 Jan 2019 from Raetihi township. At the time of the novel Raetihi would have been the King Country’s largest settlement boasting a population of around 5000. Now little remains save a soulless service station and a few derelict shop fronts. 11km of road running to Ohakune passed unsurprisingly without incident. 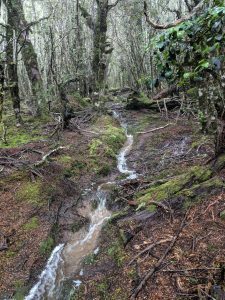 Similarly the run through Ohakune township and ascent up the ancient Blyth track passed without note. From there it was into what the ‘Ring of Fire’ ultramarathon refers to as ‘The Missing Link’. 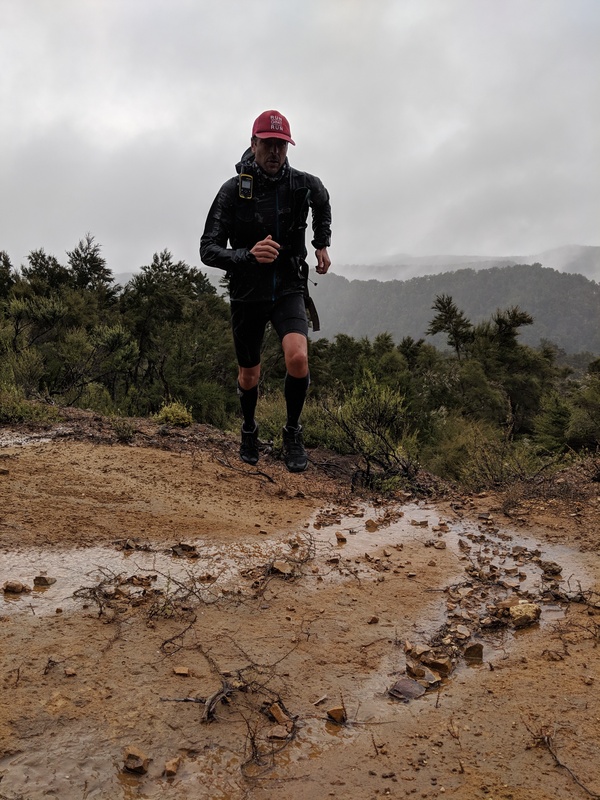 A choppy section of the ‘Round the Mountain’ circuit that takes in some epic volcanic terrain with mega valleys and tough rocky surfaces all in the open blast fields of the South-Eastern flanks of the mighty Mt Ruapehu. The weather was perfect and the running was great. The altitude and open country offering spectacular vista of near limitless horizons. A stolen glance from whence I had came – Raetihi, now an indistinguishable smudge of buildings in the blueing haze of the distance covered. 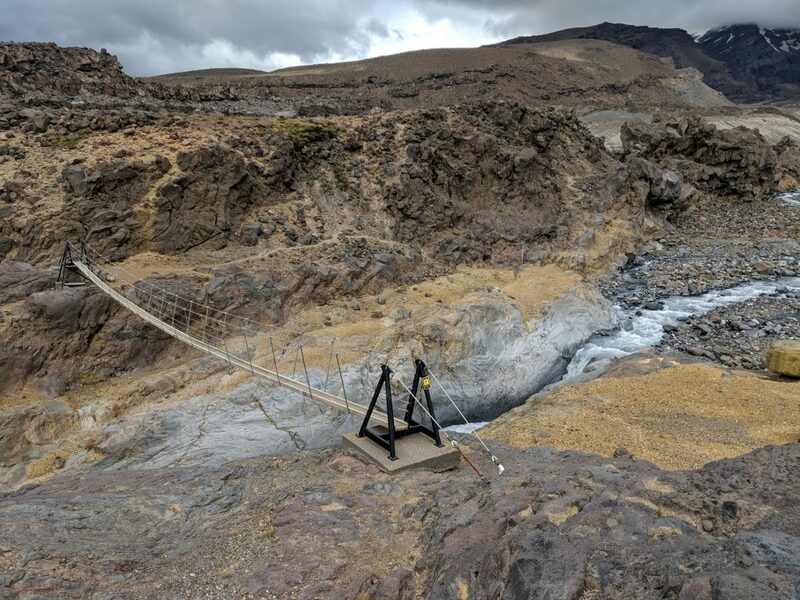 I rounded the mountain carefully picking my way through lahar fields and across numerous valleys reaching the Tukino ski field access road in the early afternoon of the first day. The weather was without fault save perhaps the persistent dry heat making water a constant scarcity. I had taken one 500ml soft flask which I would use to refill and empty several times at key water crossings however some longer drawn out sections would see me going many hours with no water at all only to pay catch-up in the next available stream. That afternoon would prove to be one of those with a memorably parched 5hr stretch between hydration opportunities. Crossing State Highway 1 I left Tongariro National Park and entered the Kaimanawa “Forest” (/tussock) Park utilizing the ‘Southern Access Corridor”. To the north lay thousands of hectares of mountainous wilderness populated with wild deer and hunters famous for identifying their target only once they had reduced it to a corpse. To the South lay the strictly off-limits playground for the NZ Army, famous for not actually existing. Straying off course in either direction would likely lead to gunfire and I was in no mood to test the hospitality of either party. 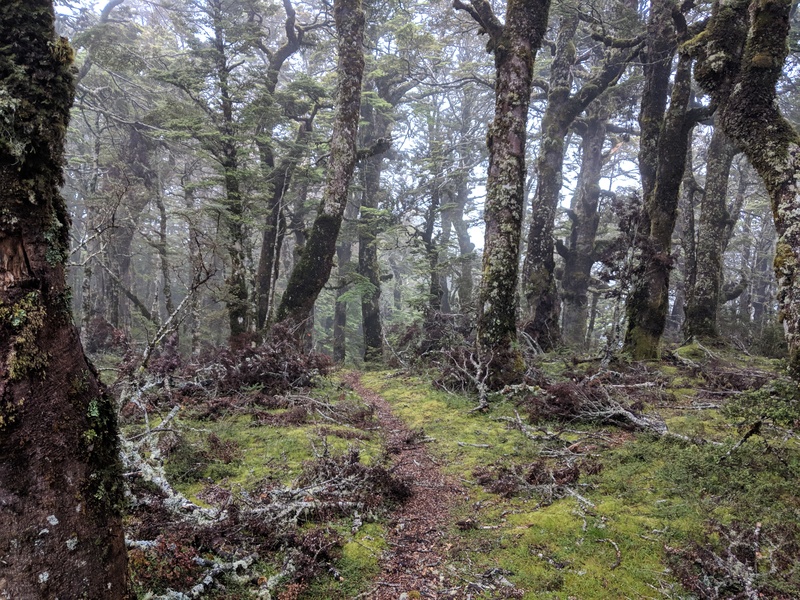 I pressed on until nightfall greeted me and navigation became impossible without relying solely on my gps and stumbling blindly forwards in lumpy tussock in the hopes of picking up a track of some description. No such track existed at this point and any semblance of humanity had been washed away by a sea of beige and waves of tussock as far as I could see in every direction. 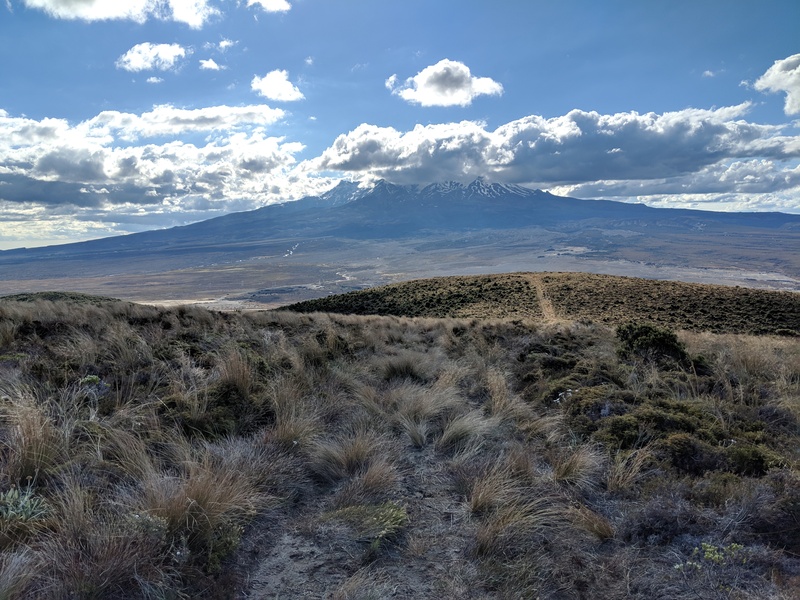 I was tired from being on the move for over 12 hours and having covered some 74km of volcano, desert and tussock lands. I decided to get out my small bivy bag (basically a goretex bag liner not much bigger than a sleeping bag), crawl into it and sleep. I found a sandy loam, no bigger than my person, somewhat concealed from the East by a bank of desert shrub. With only enough space for myself, all my gear would spend the night outside, save my scarce supply of muesli bars which I wouldn’t risk with whatever night creatures called this wilderness their home. My sleep was broken by the constant harassment of wind and light rain, waking to a grey world with my sandy loam turned muddy and sticky. I sent a few safety messages on my Iridium communication device (Garmin InReach). At 1400m the weather had become stark contrast from the evening before and I needed better shelter and some time to think through my next movements. 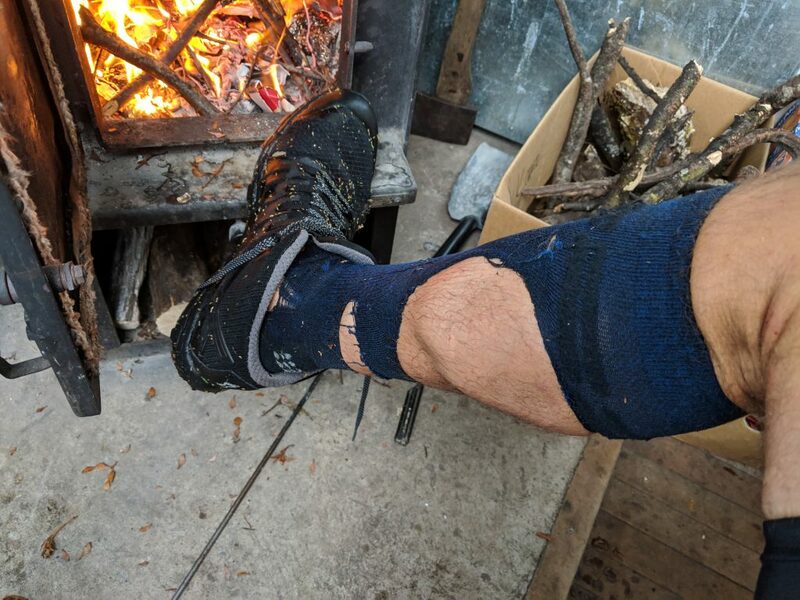 The only clothes I had taken for this multi day run was my running tights, a technical running shirt, a 200gm Long Sleeve Thermal and my light weight seam sealed jacket offering barely two layers against the hideous alpine weather that I not anticipated. Ahead, day 2 would be a HUGE battle against unrelenting terrain with no refuge, no tracks and omnipresent solitude meaning my decisions were entirely mine to make. 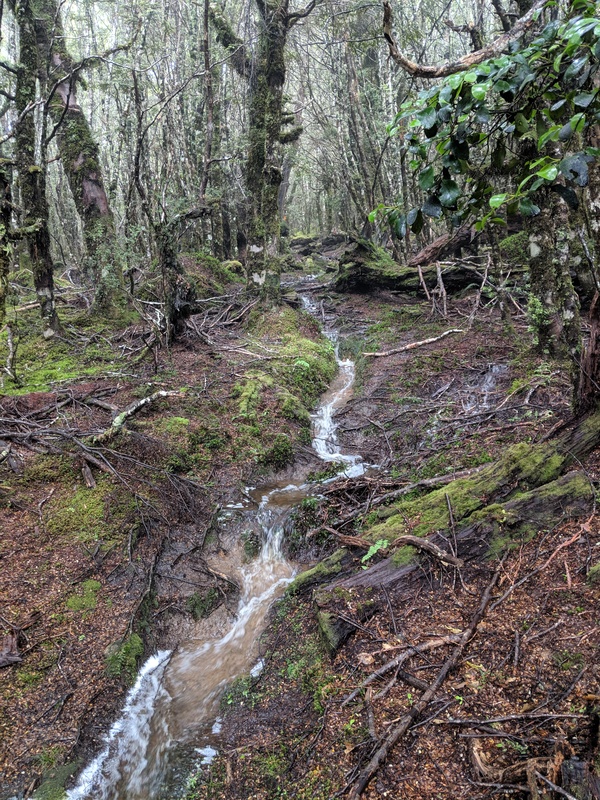 I needed to make the Otamatenui Stream which would offer deep valleys and respite from the biting wind and sideways rain. Not for the first time I contemplated giving up. The option I chose was to push ahead – FAST. I needed to clear a couple of climbs and traverse an exposed ridgeline before descending (sharply!) to the stream. It was early in the day, the sun was yet to bring it’s warmth to the world. A grey haze would confuse my way forward and at times I could swear I had turned back on myself only to find unfamiliar terrain which suggested I was somewhere new. Rocky mountain tops eventually conceded to the upward march of Beech forest and as the descent to Otamatenui Stream couldn’t have come soon enough. Off the ‘tops’ the valley offered escape from the maddening weather but presented new challenges. The stream dived deep into canyons walled on either side by slippery rock and sheer cliffs. 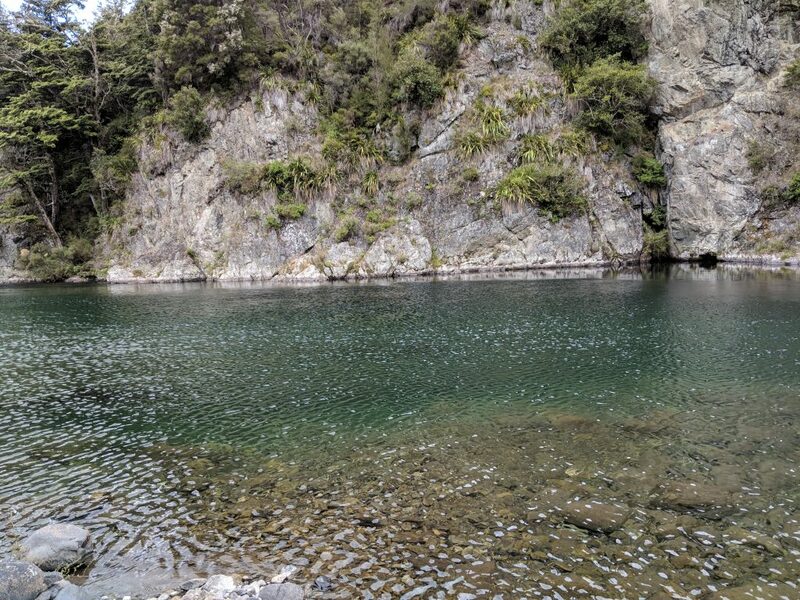 I had envisioned a leisurely stroll along a bubbling brook but instead I was presented with impassible waterfalls where water dove into pools turned jade green by depths of 8 metres or more. I love a day playing in a river but this day was to be a long one and I had little time to afford the luxury of sweet bombs and swim-throughs. 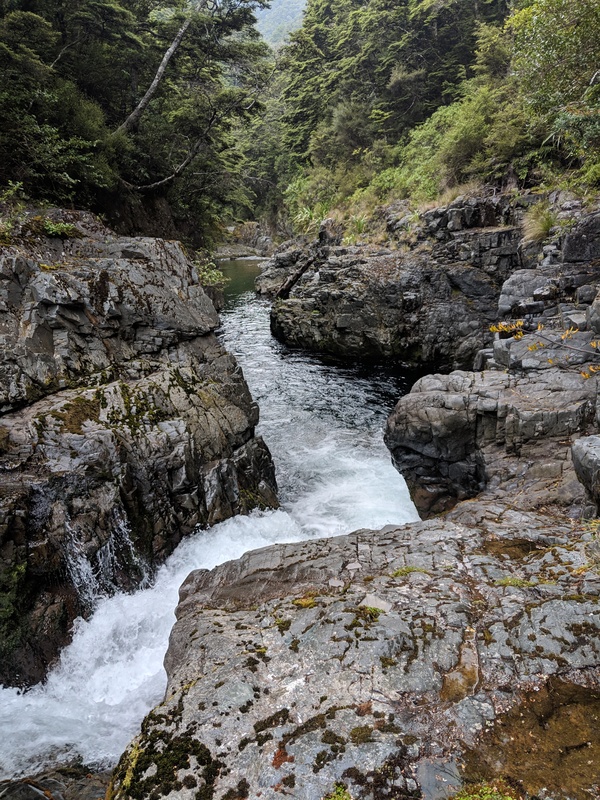 Almost immediately my ambition to push quickly downstream was met with disaster when during a scramble across a rock face my feet slipped out from under me. I grabbed wildly at some vegetation which fortunately held and in that moment of prostration I spared a glance at the fall to the depths below. My concern not for my well-being but for my precious electronic navigation and safety devices which would likely not survive the plunge and swim to safety. I gingerly retreated to rethink my options. I’d need to be more careful. Doubling back at times to try sidles on opposite sides of the river I was hemorrhaging time. I was covering 1-2km an hour and the dream run had become a nightmare. I pulled pin and started to bash my way back up towards the relative safety of the ranges when I crossed a vague trail barely recognisable in the dense bush. It worked. Staying high above the canyons the passage of possum, deer and pig had pushed light tracks into the hillside which allowed for slow progression around what would be the last of the Otamatenui canyons. I battled through Bush Lawyer, a ruthless vine of the blackberry family perfectly camouflaged by the tumble down bush. The plant dominating any spaces where light fell, ripping at my knees, tangling, biting, scratching. With each bend in the River I’d be forced to cross as the water pushed into a sheer wall of rock. At times up to my chest I’d startle massive rainbow and brown trout and as I trudged one crossing to the next I’d slip and smash my toes or ankles into submerged boulders. I was aware that this abuse was quickly leading to a colourful mess of toenail and bruising. Countless times I was forced to cross the river back and forth for what would eventually take 4hrs to cover around 10km. Leaving the main flow at the Mangamaire confluence I struck northward. My route required I traverse the Kaimanawas for 20km along a remote ridgeline spanning from Prominent Cone in the south to Makokomiko peak in the North. 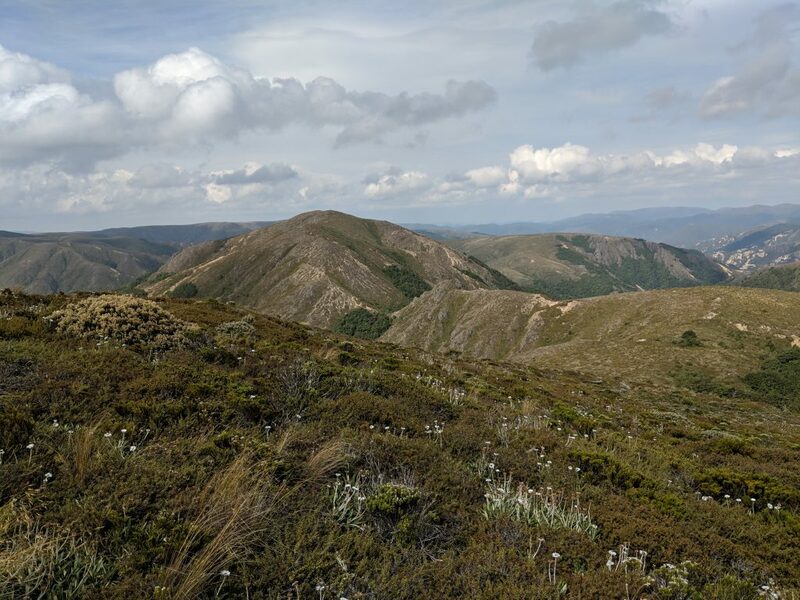 This would be an exposed section of braided ridgelines rumbling along around the 1400m mark. Worsening weather was expected that evening and the labyrinth of spurs would make following the main ridge impossible by night. 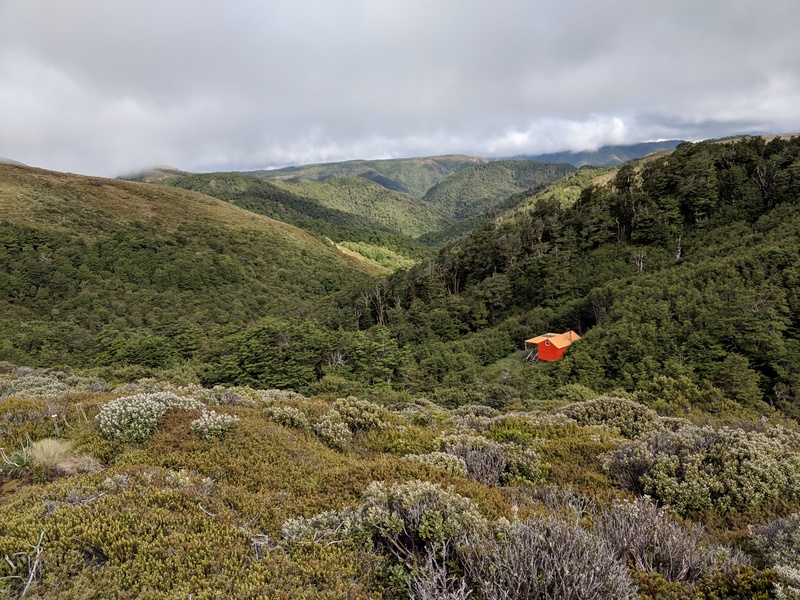 Either I needed to commit to attempting completing the ridge in the remaining daylight or climb into my bivy bag in the calm of the treeline and wait out the approaching rain front. I hesitated looking at my watch which read 15:00. I had been going for about 9hrs and if I was to push the ridge it’d take everything I had left. “Make good decisions” had become the mantra I was repeating to myself as I broke from the Mangamaire River and began the 75% 700m climb to Prominent Cone. With little time to talk myself out of it I had committed. It would be a race against the sun with the terrifying promise of wind and rain that would consume the mountains by nightfall. Hands clutching, quads driving, sweat pouring, I understood enough from my racing days that I was dipping in and out of threshold breathing heavily but always driving forward. I burst from the bushline to see the Cone above me with the urgency of the 20km ahead pushing me forward. 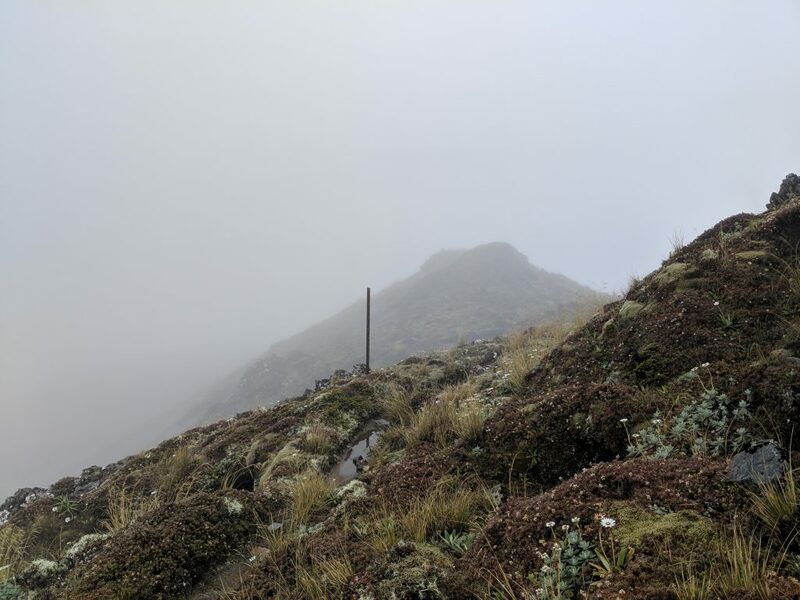 There were no trails just lumps of alpine plants and occasional sections of exposed rock where weather had blasted the mountain free of vegetation. I was running the ups, skipping the short descents never stopping to take in the beauty of where I was and what I was doing. I was afraid. If I spared a glance I could make out a wall of blackening grey as rain cloud enveloped the ridges to my West. One at a time the ridges would falter and fall to the weather as the mist of rain would devour the valley between each range. As I ran I counted them down “3 ranges away….. 2 ranges away…..” I was making good time but had underestimated just how far I needed to cover. The sun had long been devoured by the encroachment of shadow but sufficient light made the distant ridgelines navigable but every glance at my GPS showed how much ground I still had to cover. Ahead lay 20km of this magnificent mountain spine. As the light began to fade I chanced a moment’s pause to get out my headlamp and put on my softshell. It was then that the rain finally caught me predictably as the night began to close in around me. I had made it to the final spur but only JUST. I plunged into bracken and began what would be a near impossible bush bash down to the Ngaruroro River. Some of the densest thicket I’d ever experienced tore at me, shredding my socks before finally, exhausted, I was delivered unto the lowlands of the river. I had one remaining climb for the day which would follow the crossing of the Naruroro. 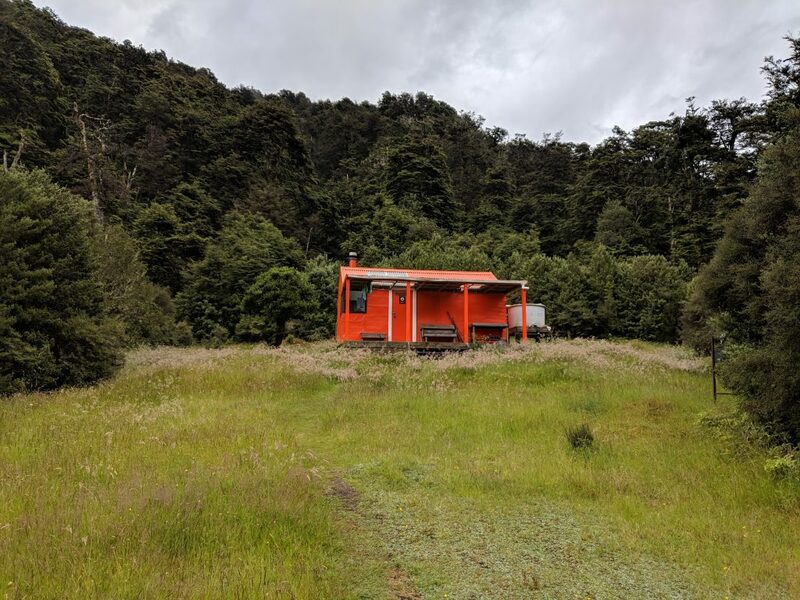 All day I had told myself that if I could clear the Kaimanawas and make it to the sanctuary of the Kaweka trail and hut network I would have broken the back on the mission. The crux of the mission being the vacuum of humanity separating where I had slept that morning and where I now stood. Stumbling into the Tussock Hut around 10pm I near collapsed. I let exhaustion take me and I was soon asleep on the floor of the hut as the sound the promised rain washed across the thin tin roof. Day 3 dawned as the last, grey and wet. 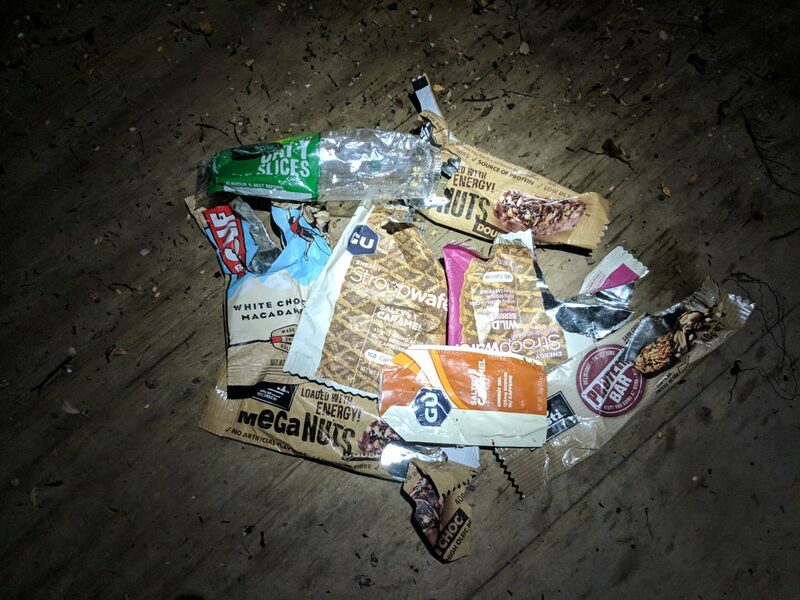 I took stock of my rations and realised that in two days and nearly 29hrs of running all I had eaten was 5 muesli bars, 2 stroopwafels, a handful of oats and a gel. 29hrs of race fuel? Probably not enough. I was certainly behind on calories but prolonged fasting had taught me that I would comfortably last days with the remaining muesli bars but my speed would suffer were I not to get a quality meal soon. Harkness Hut – supper time. I departed late waiting for the weather to abate. 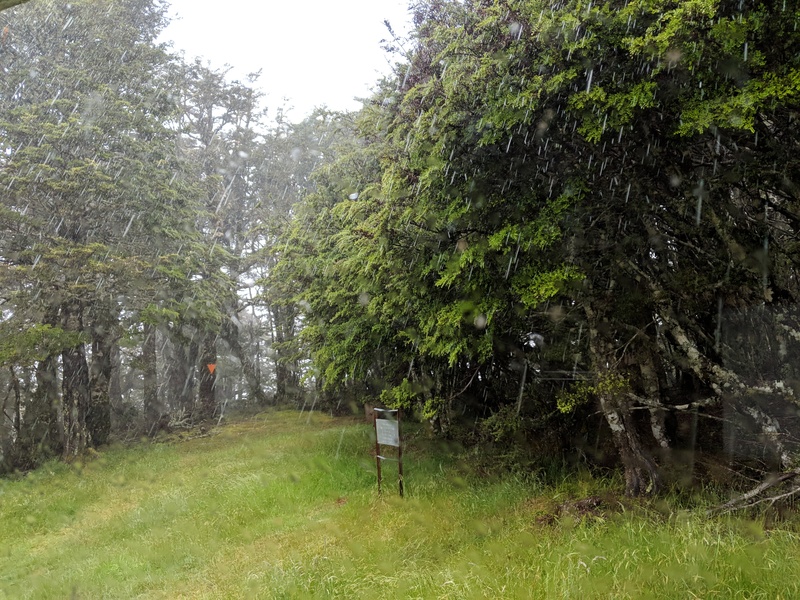 The short journey to the next hut would have me crossing the Harkness stream a few dozen times as the rain persisted, seeping through my jacket and rendering me soaked to the bone. 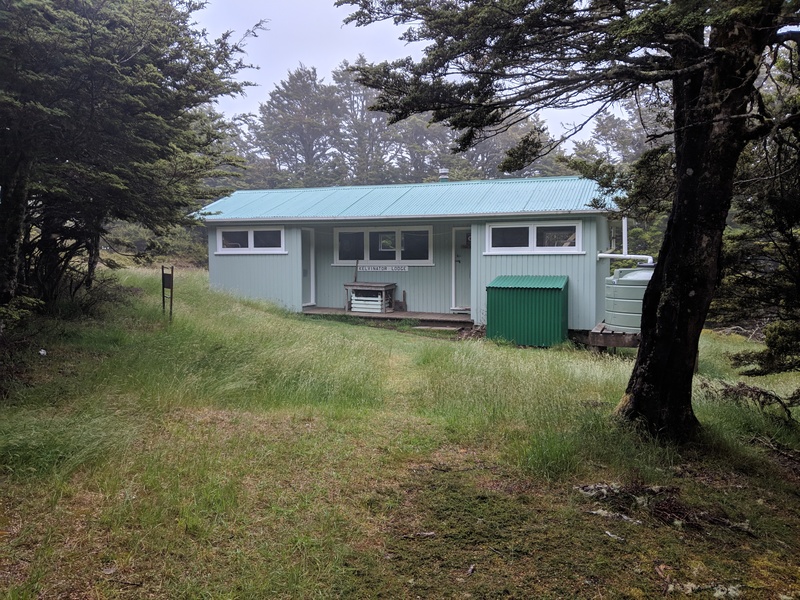 I arrived at the Harkness hut and resigned to the very real likelihood that I would need to wait out the weather here for a few days before being able to push up to the Kaweka high country. I quickly started a fire and began to dry my clothes – all of them. 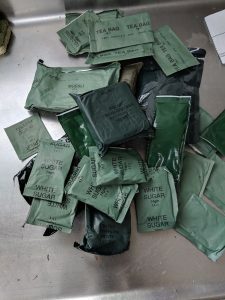 I noticed a bag of food had been left in the hut and to my surprise it was a complete army ration. I tipped it out and inspected its contents. Without hesitation I opened the packet of ‘Chicken Casserole’ into a frying pan and began to heat it over the fire as my wet clothes hang slowly dripping themselves dry. The Casserole could only be described as beige. Small pieces of corn were recognisable and lumps of grey meat suggested a chicken had surrendered it’s life to my warm gruel. My wafer thin ‘plant-based’ diet would have to go on hold as I sat naked devouring my first course of army rations. No sooner had I finished eating the rain stopped. It was mid afternoon, around 5pm and I glanced through the window of the warm hut to see light grey where previously rain clouds had prevailed. I had a chance to push for the next hut so I took it. Hurriedly I packed my possessions and set off quickly sparing a few moments to put my clothes back on and tidy the hut. Within an hour I had ascended to Te Puke hut realising that with the surprisingly mild weather I had a chance to make the next. A longer stretch on rolling terrain at altitude I budgeted around 2 hours to make the next stretch to my primary objective for the night – Tira lodge, aka ‘The Kelvinator’. Oh no! I had eaten 17 year old cheese spread! Oh no! I had eaten 17 year old chicken casserole! My last two meals were almost old enough to vote! Immediately I discarded the noodles and remaining rations worried that all too soon my bowel would be set upon with the sound of Gordon Ramsey reading a hate speech in German. I slept waiting for an onslaught that thankfully never eventuated. Outside the world was apocalyptic. The light rain forecast had somehow become a full blown Eastern weather pattern and it was clawing at the mountains, hammering water on the roof with the sound of a passenger jet on take off. I wasn’t going anywhere any time soon. I had no choice but to wait it out. 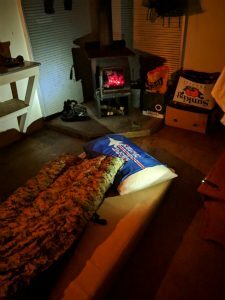 The next 30-odd hours passed with me mostly hiding in my sleeping bag in a corner of the hut reading Guns and Ammo magazines while waiting for the torment to end. A 3 day run had become 4 days, then 5. I would allow myself a couple of muesli bars each day which would have been ample had hunger not dominated my intense boredom, frustration and cold. Out on the tops I began climbing to Whetu as the wind howled up the valleys so hard that it was difficult to bring my trailing leg back without ankle taping myself on the way through. Again water pushed through to my core and with the cold temperature and insane wind speeds I knew that I wouldn’t last more than an hour at this altitude. Not for the first time I was scared. Picking off waritahs that marked the route in the persistent grey. I would find refuge behind a boulder then dash to the next trying my best to pick out the true ridgeline where the trail would be impossible to follow. Somehow I reached Whetu and began running as hard as I could to the safety of the treeline. Once again enveloped by beech forest I sent a couple quick messages to let those watching know I had cleared the danger and to arrange pick-up. 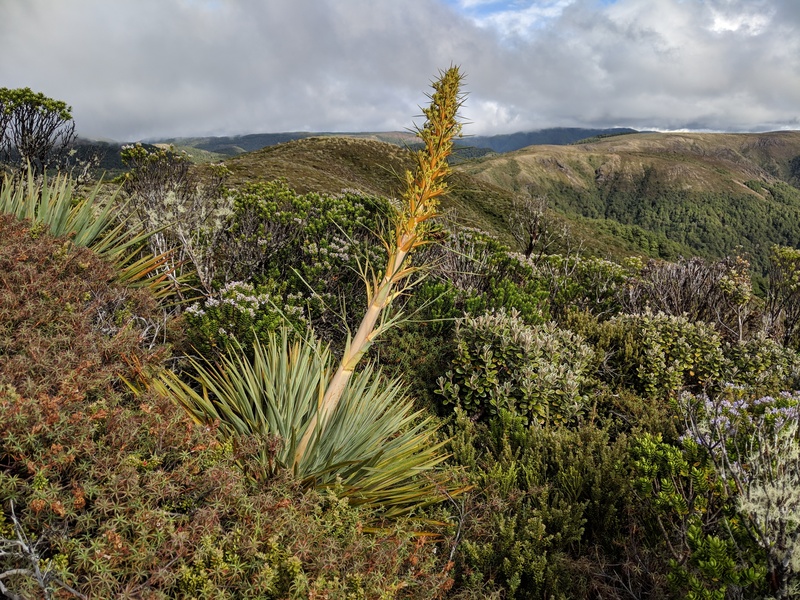 The next two hours descending to the road showed the supreme contrast of environment with relatively mild lowlands once again settling my nerves as I closed out the final few kms to Middle Hut car park. Arriving around 9pm my 174km, 36hr run which should have taken 3 days had taken 5. Unexpected weather and the decision to travel light had cost me a couple of days but I was happy. I had succeeded in completing one of my most memorable and taxing adventures having recreated an ancient work of fiction. I was beaten, hungry, but content. This entry was tagged Fast Packing, Kaimanawa, Kaweka, Man Alone. Bookmark the permalink.